Welcome to St. Stephen's Evangelical Lutheran Church! To serve God by serving each other and our neighbors, as we share the Gospel of Christ in word and deed. Click on the "Upcoming Events" tab at the top of the page to view our newsletter and keep up to date on activities and special services! 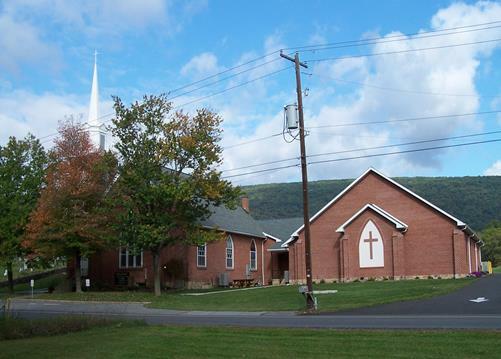 On February 25, 1861, a planning committee met to establish a new Lutheran Church Congregation in the Licking Creek Valley of Mifflintown, PA. The first building was erected on land donated by Samuel Aughey, Sr. and dedicated "to the services of the Triune God according to the forms of the Evangelical Lutheran Church" on December 8, 1861. There were 54 members and Rev. R.H. Fetcher (1861 - 1867) served as minister. On April 29, 1874, the name of St. Stephen's Evangelical Lutheran Church was officially adopted. The current brick building, replacing the original frame structure, was dedicated on May 15, 1887 under the ministry of Rev. Philip Graif (1885 - 1890). March 5, 1914, a storm blew off the original steeple and bell tower. The steeple was finally replaced on May 15, 1999 and the entire church building was re-dedicated on September 19, 1999. Over the years, renovations were needed to update the building. The addition of the Sunday School/Social area to the rear of the church and additional parking lot was made in 1953. The basement was constructed in 1965. Later, a remodeled church office and additional Sunday School rooms led to the expansion of the original social area in 1990 - 1991. July 1, 1977, the Mifflintown Lutheran Parish, which included St. Stephen's and Messiah Lutheran Church, was dissolved into separate parishes, each having their own pastor. The Rev. Lawrence M. Guenzel was the first minister of St. Stephen's congregation as their own parish. A total of 20 pastors have served the congregation since 1861, with Rev. Chris Mathiason currently presiding. St. Stephens currently serves a total of 440 baptized members and 321 confirmed members. Chris Mathiason was born in Albert Lea, MN on Dec 24, 1972. Soon after his birth, he and his parents Dave Mathiason and Marilyn Mathiason moved to Mankato MN. After 4th grade, the Mathiason family now including younger brother Matt moved to Fairmont MN. Chris graduated from Fairmont High School in 1991. He furthered his education at St. Olaf College, Northfield, MN graduating in 1995 with a double major in Political Science and Mathematics. Following his junior and senior years of college, Chris worked as a summer counselor at Good Earth Village Outdoor Ministry, in Spring Valley, MN. This lead to his being offered the position of Program Coordinator at GEV in the Fall of 1995. After two years working at camp, Chris joined the staff of St. Olaf Lutheran Church, Austin, MN as Coordinator of Youth Ministry. In 2002, after close to 5 years in Austin, Chris enrolled at Luther Seminary in St. Paul, MN. After two years of academic study, Chris began his internship year at St. Stephen’s Lutheran Church, Licking Creek Valley, Mifflintown PA. But before moving to Pennsylvania, Chris married another student at Luther Seminary, Erin Bovendam. While Chris served as intern at St. Stephen’s, Erin served as intern at Trinity Lutheran, McAlisterville PA.
After a wonderful year, Chris and Erin returned to St. Paul to complete their studies. Following graduation from Luther in 2006, Chris was called to serve as Pastor at St. Stephen’s Lutheran, Mifflintown, PA and Erin was called to serve as Pastor at Trinity Lutheran McAlisterville PA. Chris was ordained at St. Olaf Lutheran Church in Austin, MN in 2006. Chris and Erin currently live in Trinity’s parsonage in McAlisterville and have been blessed with the addition of two sons, Henry born Nov 30, 2007 and Benjamin born Feb 27, 2010.